The Northern Pygmy Owl is very small in size and has a gray coloring to it. Many people often mistake it for a pigeon due to the coloring. They also have some brown and red though on the edges of their feathers. They also have white along the belly so you can tell when they are looking your direction that it is an owl and not a pigeon. They also have two black patches on the back of the neck. They look like a pair of eyes and that serves as a great deterrent from predators. It is confusing to predators to see what they think are eyes looking at them and they often will leave the owl alone instead of pursuing it. They also have a very long tail. The females are slightly larger than the males with a size of 7 inches and the males are about 6 inches. Both have a wing span of about 15 inches. They enjoy being in the forests to the tops of the tree lines. In other locations though they are found in the valley areas. They don’t go into the deep forest areas though but will remain in the open forest areas. They also like to linger around the wetlands. The Northern Pygmy Owl is well diversified out there in the Rocky Mountain region. They are also in areas of North America, British Columbia, and even found in some areas of Alaska. 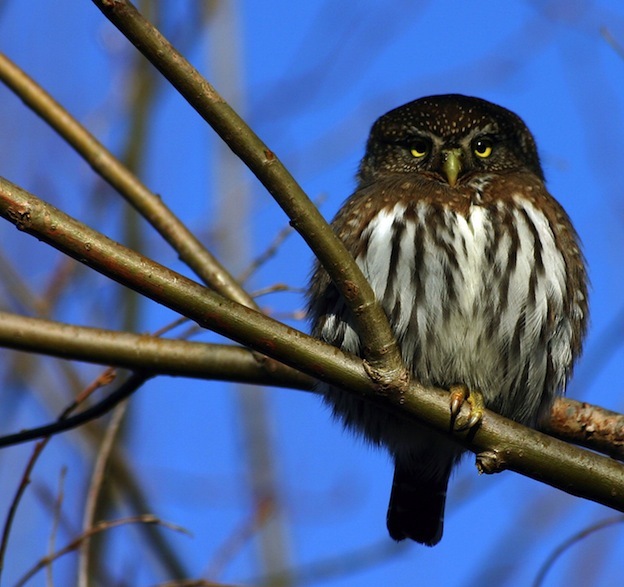 Observing the Northern Pygmy Owl you will notice that they are very secretive in nature. They try not to be seen by humans or other animals. In fact, you may not realize you have these owls around other than for hearing them at night or finding the pellets that they leave behind as evidence. Even though this is a small species of owl, it is very aggressive in nature. They are more likely to attack animals around them instead of just flying away. They have also been known to attack humans when they feel threatened. When it is going to attack the body puffs up so that it can appear to be much larger than it really is. They are noisy owls at night, making it hard to ignore. The have a sound that carries on making a too too noise. The males seem to be more vocal than the females as they are more into protecting their environment. This particular species of owl doesn’t have the element of surprise that others do. This is because it has noisy feathers that can let prey know it is coming. Almost all species of owls are silent in flight. This is why they tend to be the type of predator that sits and waits. They are very patient and they can wait along time before something to eat comes along. They are very strong owls so don’t be surprised that they will take on prey that is about three times their own size. They use their strong talons to pick them up, pierce them, and to carry them off to a private location where they can eat. The will consume birds and small reptiles. The eat lots of mice and rabbits because they are plentiful. The only time that these owls really interact with each other is during mating. The calling will get louder and more frequent than normal. As males and females respond to each other they will pair off. They eggs can be laid from April through June. The average clutch is from 3 to 7 eggs. The females will incubate the eggs for about 29 days before they start to hatch at intervals. The young grow very fast and will be more than half of their adult size in just the first two weeks of life.